Remember THIS awesome bread recipe I reviewed? Like most of you know, I used to work at Panera Bread and I am still obsessed with their food. 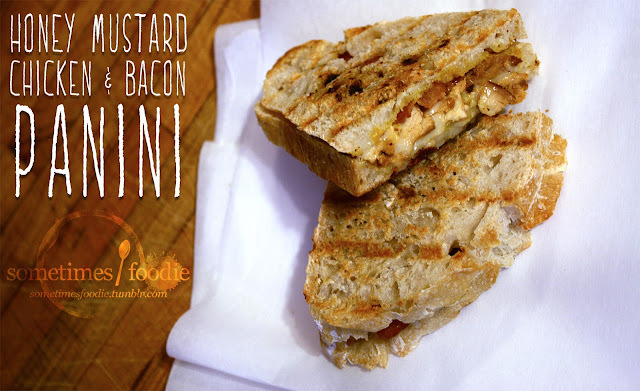 One of my favorite paninis was the (now discontinued) Chicken Bacon Dijon. I worked at every station at Panera and I usually made all of the paninis each weekend, so I knew what was in it. What's to stop me from recreating it on my own? **If you don't have whole grain mustard, which I didn't, I mixed some spicy brown mustard with yellow mustard which worked out quite well. Start by mixing the mustard (or mustards) with the honey and bacon bits in a small bowl. Add your sliced Swiss cheese (American works nicely too) to one side of the bread and top that off with two strips of bacon and your precooked sliced chicken breast. I put a kitchen towel on top of my grill and manually pressed down to create a deliciously crisp panini.